The CoP comprises the 19 Parties in the Americas ratifying the Montevideo Agreement. As the IAI’s principal policymaking organ, it establishes, reviews, and updates the Institute’s policies and procedures and evaluates its work and accomplishments. It also reviews and approves the IAI’s Scientific Agenda, annual and long-range plans and financial budgets. 1The EC is composed of nine members, who are elected by the Conference of the Parties for two-year terms. The Executive Council develops policy recommendations for submission to and approval by the Conference of the Parties and ensures that policies adopted by the Conference of the Parties are implemented by the Directorate. The SAC is composed of ten members elected by the Conference of the Parties for a three-year term. As the IAI’s principal scientific advisory body, it makes recommendations to the Conference of the Parties regarding the IAI’s Scientific Agenda, long-range plans, and annual program. It also directs the peer review system for evaluating scientific proposals and assesses the scientific results obtained from IAI’s funded science programs. The SPAC was established by the CoP in 2013 to provide advice to the CoP and the IAI Directorate regarding the application and design of science in policy and decision making. The initial composition of the Committee was approved by the CoP in 2014. This group was in charge of drafting the terms of reference of the committee as well as any other rules needed for its function. The Integrated Operations and Finance Directorate is the headquarters of the IAI Directorate and is based in Montevideo, Uruguay. This Directorate is run by the Executive Director of the IAI, who is elected by the Conference of the Parties and is responsible for the IAI programs and operations. Institute Research Centers shall be developed and designated by the Conference of the Parties only based upon proposals submitted by Parties interested in hosting such Centers in their own territory. Each Institute Research Center must have a long-term commitment to a program of research within the objectives of the Institute. Established in March 2012, AQUASEC is the first such IAI’s Research Center. See Decision XVIII/18: The CoP recognizes that the establishment of Centers of Excellence for Global Change Research is the fruit of the scientific efforts supported in the framework of IAI CRN and SGP-HD programs and endorses the establishment of the virtual Center for Water Security at University of Arizona and Pontificia Universidad Católica de Chile. 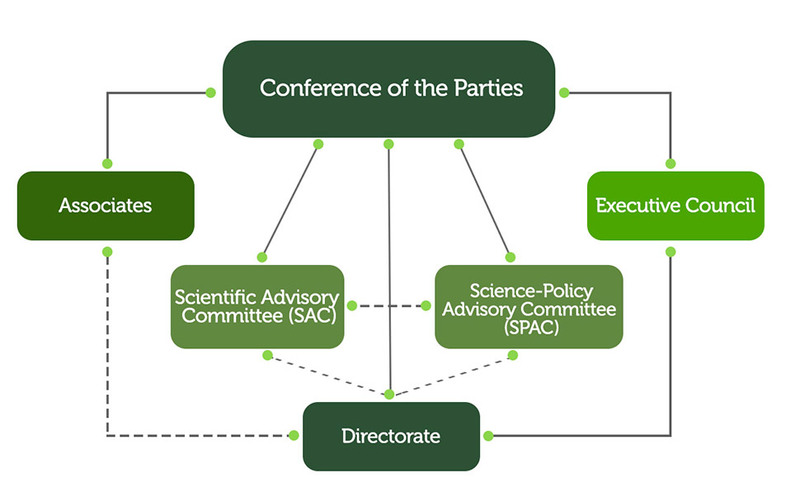 The Conference of the Parties may invite States outside the region, regional or international intergovernmental organizations, and industries and other non- governmental and private organizations interested in supporting the Scientific Agenda and programmatic activities of the Institute, to become Associates of the Institute. An institution which submits a proposal for a specific research project, through the appropriate Party, may be designated by the Conference of the Parties as being affiliated to the Institute for the duration of the project. The Conference shall base its decision on a review of the proposal, taking into account the views of the Scientific Advisory Committee as to the scientific merit of the proposed project and its relevance to the objectives of the Institute.